So you’ve finally gone out and started the home gym of your dreams. You’ve begun to get all the equipment and weights you’ll need to really shape your body, including, of course, a full set of dumbbells. Now, however, you’ve got a pile of dumbbells on your floor, and it’s really beginning to clutter up the place. Luckily for you, we will help you find the best weight rack out there. There’s actually a list of them below. That said if you’re overwhelmed with all the choices, I’d suggest you go with the Body Solid dumbbell rack. You can find it on Amazon.com here. A dumbbell rack isn’t the first thing that springs to most people’s minds when they’re filing out their home gym, but it’s exceptionally useful. Not only does it reduce clutter and allow for a better display of your weights, but it has practical purposes too—a well-organized dumbbell rack makes finding the proper weights simple, allowing you to move to the next phase of your workout quickly and efficiently. 2 Upgrade Your ﻿Home﻿ ﻿﻿Gym﻿﻿! 2.1.2.1 What I didn’t like about it? 2.1.4.1 What should you be aware of? 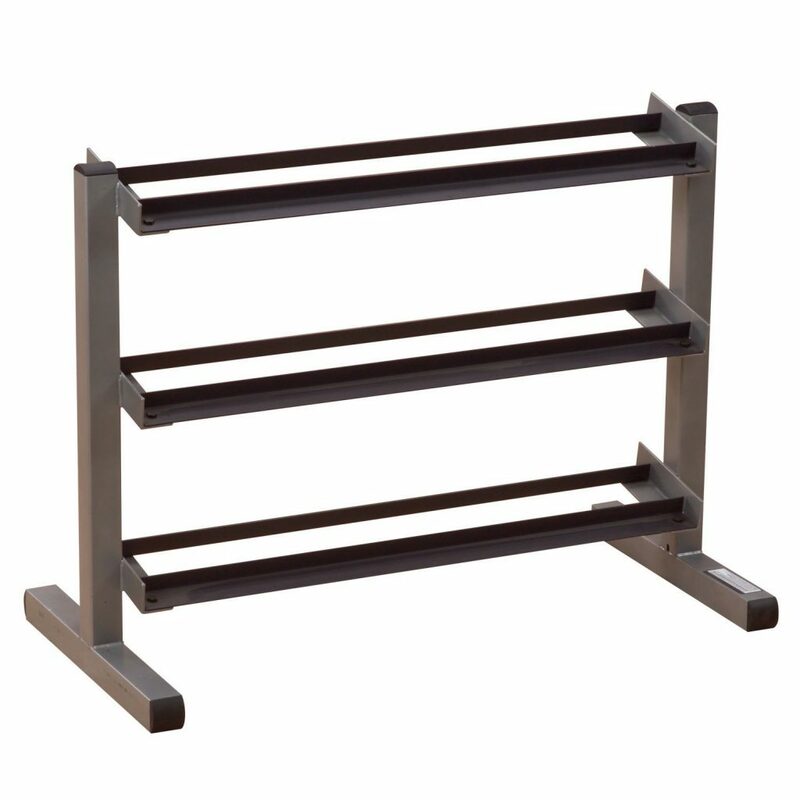 Made from solid steel, and standing 33 inches tall and 36 inches wide, the Marcy three-level rack is a very solid piece of furniture. It’s rated to hold 800 pounds, though if you’re working on those high levels, you’re unlikely to squeeze more than a dozen dumbbells on there anyway, so it’s unlikely that you’ll overload the thing. The rack can accommodate multiple sizes, so you can get more small dumbbells on the rack, but if you’re working with large weights, assume you’re going to get no more than 12 on each rack. It holds my 65-pound weights just fine, so size isn’t an issue. It’s very solidly made, and can be put together in about an hour with just a wrench; as long as you’re moderately handy, it’s easy to assemble and there’s no risk of it collapsing or anything of that nature. If you’re ordering this online, be careful—the packaging is absolutely terrible. Without any padding inside, it’s not uncommon to see dented frames, scratches and scrapes on the structural parts. Assuming everything gets to your place in one piece, this is a very good rack, but the packaging is a nightmare. The CAP small dumbbell rack will take a lot less space than, for instance, the Marcy, and is designed for smaller, rubber or neoprene dumbbells. It will hold five pairs of dumbbells, with a maximum weight of 200 pounds, so you’re probably looking at 5-25 pounds in five-pound increments. Anything larger than 25 may not fit on the bottom rack; it will depend on exactly the size and shape of your weights. It’s smaller than the Marcy, at only 27 inches tall and 15 inches long; the rungs are 3.25 inches apart, so if you have something with an odder size, be careful. Find out the price on Amazon.com! It’s pretty cheap, which is both a pro and a con—it’s probably one of the most inexpensive ways to hold your dumbbells short of just stacking them on the floor. If you only have a small set of weights, this is a perfect way to store them. It’s easy to assemble as well. Its major con, though, is distinct, persistent, and difficult to remove burnt rubber odor, which can drive you crazy—it’s not for indoor use. If you’re looking for a small and budget-friendly dumbbell rack, you’re much better going off with this one from Marcy. It’s 27 inches by 21 inches, so a little bit longer than the CAP but not as bulky as the three-level rack. 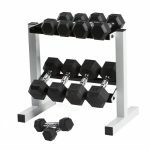 It has room for eight dumbbells on the side, and then quite a few more on the top and bottom; if you’re using smaller weights, you could easily fit 20 on this rack. I’d say it could hold about 400 pounds without any problems; if your total dumbbell weight is too much higher than that, I might spring for a sturdier frame. It holds quite a bit of weight in a very small space. I’d highly recommend it for anyone with serious space concerns. If your weights are excessively large, you’ll find issues with keeping them on the sides, but otherwise, I have very few complaints about this rack. 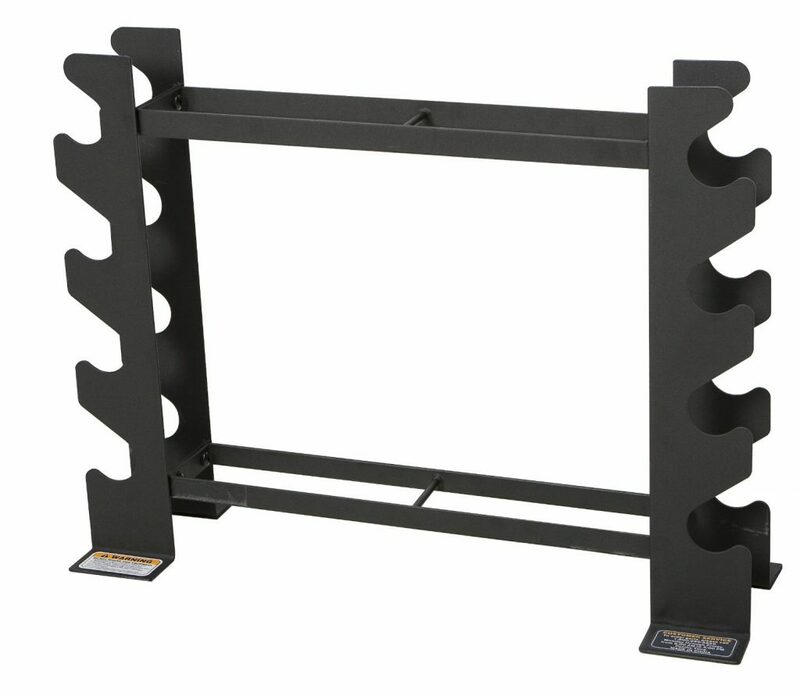 Slightly larger than the previous two, this rack can hold up to 500 pounds of weight. It is 23 inches high 25 inches wide, and it has enough room to hold about six pairs of large dumbbells. It’s a little less sturdy than some of the more expensive racks out there—it’s made of thinner steel than some of the bigger racks—but it’s sturdy enough for most purposes. See it’s Price and Reviews on Amazon.com! Quality control, again, is an issue with CAP products, however—some people have reported getting the wrong sized nuts, washers, bolts and end caps. It’s definitely something to be aware of when purchasing; the frame arrives intact, but you may need to make a trip to your local hardware store to complete the various bits and pieces. Finally, we come to the Body Solid model. If you need a larger rack, this is the way to go. It measures 30 inches tall and 40 inches wide, with plenty of room for nine pairs of dumbbells; it’s designed for hex weights going from 5 to 50 pounds in five-pound increments. Because it’s three-tiered, unlike the previous two two-tiered sets, you can nearly have your complete hex weight set in one place without requiring a second rack. The complaints I have are relatively minor. If you have cast-iron dumbbells instead of rubber-coated ones, you might want to invest in some sort of rubber protective strip to avoid metal-on-metal. I’ve also heard some people having problems with the bolts not lining up properly, but that wasn’t a problem with mine—it took less than 20 minutes from unboxing until it was ready to use. It’s sturdy and solid—if you want to splurge for a slightly larger rack to hold a complete set, I would definitely recommend the Body Solid model. A weight rack should be as simple as possible while maintaining the robustness needed for all of the weights. 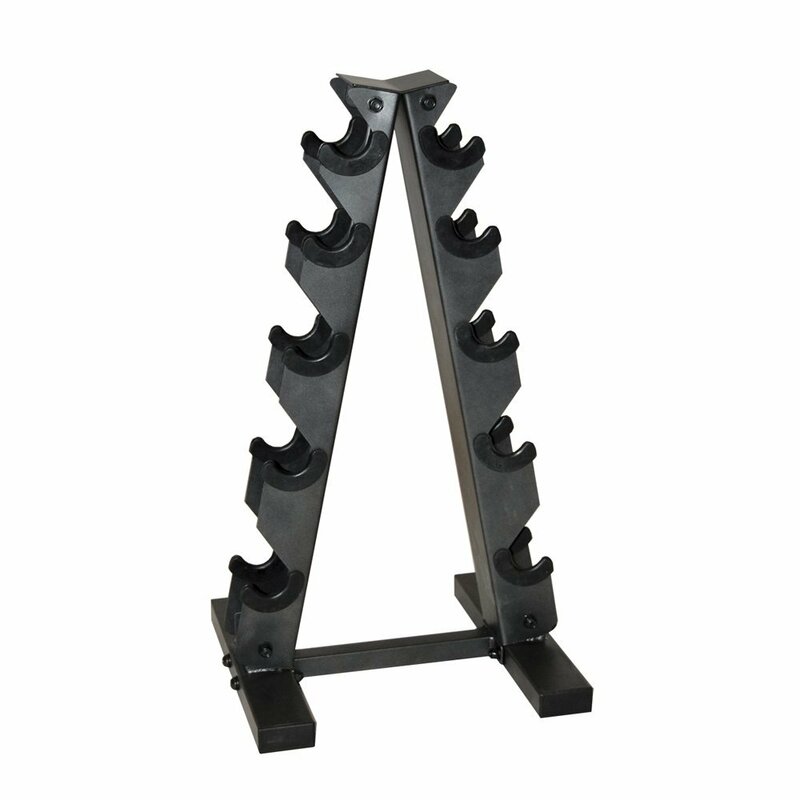 Most commercial racks use steel construction with some manufacturers putting an emphasis on thickness and robustness. Steel gauge can vary from 3 to 36 and it refers to the thickness of the material. This is important, as the thickness of the frame will dictate the resistance of the weight rack in time. 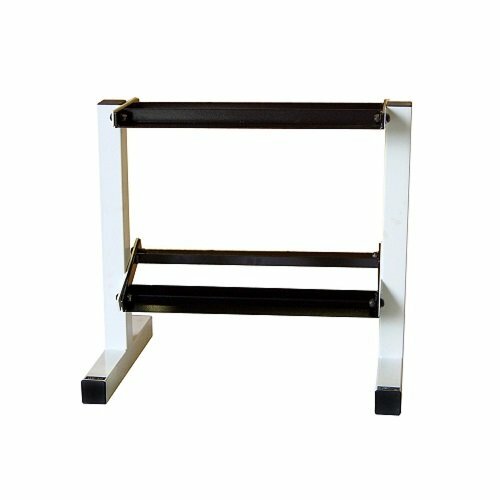 Most importantly, a solidly built weight rack will guarantee you are safe while working out. You want to make sure you get the safest rack within your budget to keep you or other users injury-free. What are the drawbacks of iron? Iron might be great for sturdiness, safety, and reliability, but it can also rust easily. Some users have reported their weight racks rusted quickly from the sweat. If you are a person who sweats a lot during a workout, make sure you wipe your dumbbells with a towel before placing them back on the rack. To help keep the rust away, you should also consider that by using the rack multiple times per week, the paint might not last for long. This is why some manufacturers introduced the plastic cover on top of the iron while others try to minimize the surface which comes in contact with the dumbbells with a simplistic design. If you are not sure that there’s a place in your house for a dumbbell rack, take a look at this video! It shows how simple is the construction of Marcy Multiple dumbbell rack and how easy it is to build it. Maybe that’s exactly what you need? Speaking of design, let`s not forget the main purpose of the weight rack. It is there to keep your weights off the floor, organized and ready to reach with ease. The way in which manufacturers delivers this may vary, but you need to look for a model which is specific to your needs. Most home weight racks need to be compact while storing enough weights (usually, pairs of weights up to 50 pounds). Most models come with 1 to 3 tier storage for cast iron or neoprene weights. This is where the design should meet your expectations. If you plan to use lower weights or have family members which might be using them, you need to consider neoprene weights storage. As they are smaller in size, the weight needs a specific tier design. But the design also applies to the weights. The design of the weights can dictate the number of dumbbells you can fit on the rack. Most weights` design is rounded or even hexagonal, although the square shapes are still not out of style. Because you will not be having the space of commercial gyms, you will need a weight rack which is versatile enough within your own home. 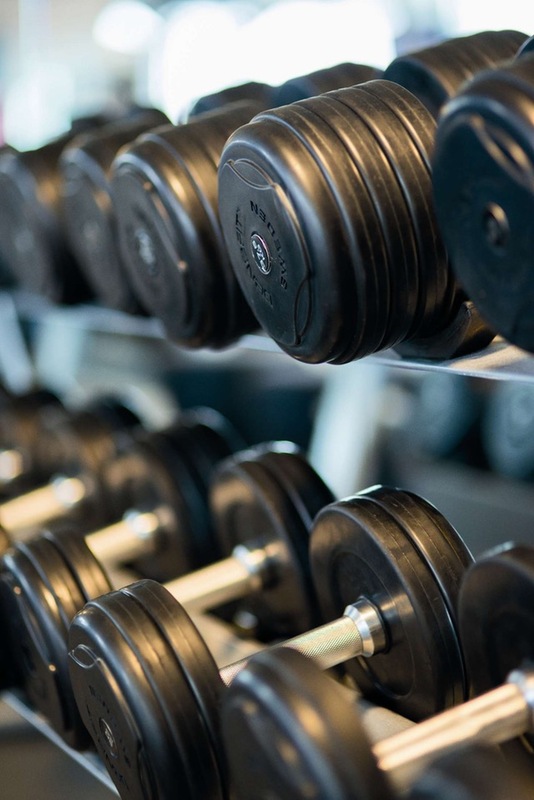 It is advisable to ensure you can actually fit all of your weights onto one rack and you might even need to consider buying two racks to fit all the dumbbells. This is common in most gyms and you should make sure you have enough room in your home for all of your weights. The goal is to organize your workout space better and this is why you may need and extra weight rack. In the end, the more weights you have the more complex your workouts can become. A good weight rack should also be movable. In time, you might want to rearrange your weight room and you should consider a rack which can be easily placed against any wall and which doesn`t require any floor anchoring. You would find other features might be a priority for your own fitness goals. However, construction, versatility, and design should be a good starting point for any long-term purchase. A weight rack is not one of those purchases which are upgradable; thus, it becomes important to choose the right one from the start. Steel construction is obviously a sign of endurance, but you may also want to consider that steel is prone to rust. If you sweat a lot, you may need to consider cleaning your dumbbells after each use to prolong the life of the rack. Although construction is the main strength of a good rack, most users will need a versatile product which can fit a complete set of weights. This means focusing on the right product for your set of weights or purchasing a full dumbbell set with the rack. Choosing a sturdy weight rack, which comes with decent versatility, for your cast iron and neoprene weights, should be made with a design pattern in mind. Although you wouldn`t normally consider design as a top feature of a weight rack, you can simplify the process by picturing how the product will fit into your weight room. Make sure you choose a design which is not too tall to overlap a mirror, to stay clear from any possible accidents. Smith machine squat vs regular squat rack squats – understand your workout!